What would you do if you stood eight feet tall and were never able to stand? What would you do if you lived in a cage with only enough room to stick out a paw for food? What would you do if your teeth were cut off and your nails pulled out? What would you do if your ulcerated insides burned from a rusty catheter thrust into your gall bladder to milk its bile? What would you do if you were an Asian Moon Bear? In October 2000, 63 long-suffering endangered Asiatic Black Bears, nicknamed Moon Bears because of the crescent-shaped marking on their chests, arrived at Animals Asia Foundation’s (AAF) Moon Bear Rescue Center in Sichuan Province, China. 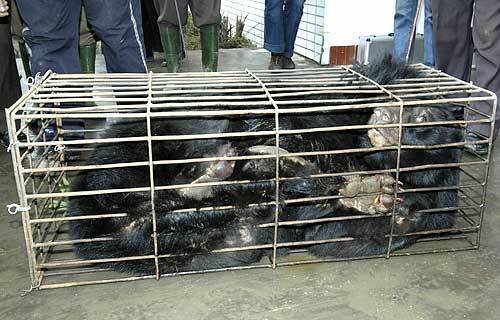 Thus began the world’s largest rescue of Moon Bears from bile farms in China, where today approximately 7,000 remain imprisoned in coffin-like cages throughout the country. This historic rescue is the result of a special partnership between the Sichuan Forestry Department, the Beijing-based China Wildlife Conservation Association and Animals Asia Foundation (AAF). Although bear bile does have medicinal properties and can be used to treat gallstones and liver disease, the advent of bear farming in the early 1980’s led to a glut in production, and now bile is often marketed in products such as shampoos, wines, sodas, and lozenges, where it is absolutely useless. There are over 50 herbal and synthetic alternatives, which are used worldwide and are cheaper and equally if not more effective. The bears arriving at AAF’s sanctuary have either a 5-7 inch stainless steel catheter permanently implanted into their abdomens, or they are victims of the new ‘free-dripping’ technique of bile extraction, in which the gall bladder is opened and either stitched or linked by a tube directly to a corresponding hole in the abdominal wall. Although the daily bile extraction is terrifying and excruciating, some bears survive decades, literally growing into the bars of their cages, and are often missing one or even two limbs due to the trauma of being captured in the wild. Many also have had their teeth cut back to the gums and their claws or even paws removed on the bear farm, in order to eliminate their natural defenses and make them easier to milk. Americans and Canadians can help in numerous ways, including writing letters to Chinese officials, downloading and completing anti-bear farming petitions, distributing leaflets, ‘hosting’ donation boxes in various business, holding fundraisers, etc. Please visit the following link for further information about how you can help: Visit the Animals Asia Website. There is also a special Kids’ site with activities and ideas for ways young people can get involved in rescuing Moon Bears: Animals Asia-Kids. Animals Asia Foundation is funded entirely on private donations. If you would like to support the rescue, please visit www.animalsasia.org, e-mail info@animalsasia.org or call the toll free 888/420-BEAR to learn how you can make a difference in the lives of the Moon Bear. (If you prefer to send your donation by check: Our U.S.mailing address is Animals Asia Foundation, PMB 506, 584 Castro Street, San Francisco, CA 94114. Mail sent there is forwarded directly to Hong Kong a couple times a week. Editor's Note: I was so incensed and outraged, saddened and shocked when I saw the Moon Bear photo that I must share this information with you. Of all the horrible things people do to animals, this must be one of the worst! What are WE going to do? Begin by learning more about Moon Bears and then let your conscience be your guide. The Moon Bears thank you and so do we.